When I’m speaking or training, my aim is to have participants leave the room more informed and excited about the topic than when they walk in. It’s such a pleasure to step up in front of a group and provide information in a way that intrigues participants, and to watch their faces as they start to dig into what I’m saying. I enjoy gently challenging assumptions to create “a-ha!” moments and offering a range of practical tools so that people leave the room with clarity and a sense of determination about their next steps. I integrate a wide range of learning modalities into every session I craft, and I was the highest-rated conference session designer on staff at Exponent Philanthropy. As a speaker, I earned an average evaluation rating of 4.5 on a 1 to 5 scale. As both a speaker and a trainer, I emphasize interactivity and engagement of everyone present. I adjust my approach to suit the culture of the organization; for example, some boards are activated by an activity that gets them laughing, while others are more comfortable getting down to business right away. My approach is to listen first, before offering my expertise. 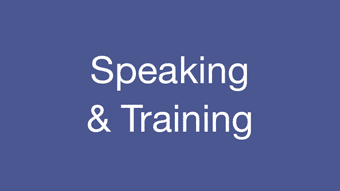 Click here for a list of my speaking engagements and the training sessions I’ve designed. I’d be delighted to talk with you to learn if I can offer training on a topic that supports your organization!